Sometimes crows can’t help it. They cause trouble at home and abroad. Last week Pittsburgh’s growing winter crow population — composed of American crows (Corvus brachyrhynchos) and a few fish crows (Corvus ossifragus) — caused trouble at the University of Pittsburgh. Andrew Mumma reported that the population roosting on Pitt’s campus exploded Wednesday night, October 17, resulting in slippery, stinky sidewalks on Thursday morning. Pitt responded Thursday evening by playing the “Crow Scare” tape near Clapp Hall. (Click here to hear it.) When Karen Lang left work around 7pm she saw a peregrine falcon, maybe Terzo, dive bombing the crow zone at Alumni Hall. Did the crows annoy him? Or was it the kakking noise on the tape? 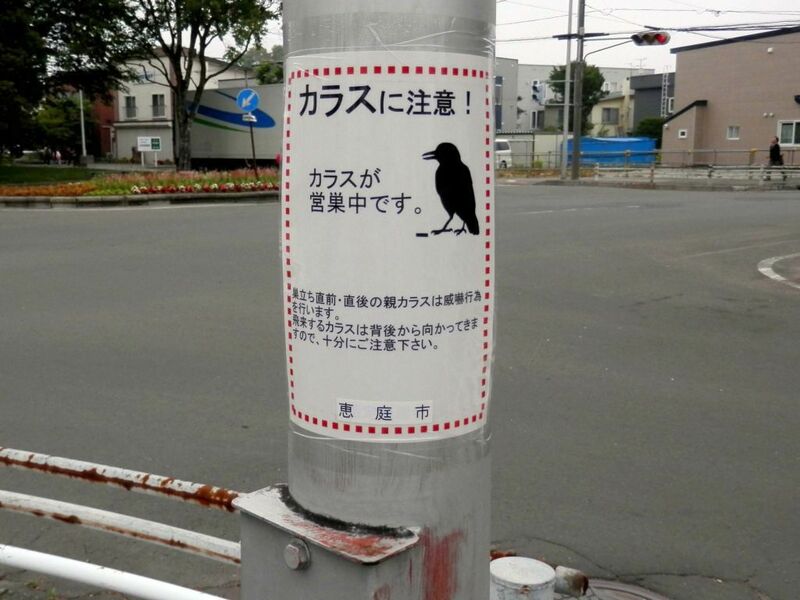 The caption for the Wikimedia photo above says “A sign warning people about crows in Fukuzumi-cho, Eniwa, Hokkaido.” It’s probably referring to jungle crows (Corvus macrorhynchos), also called large-billed crows, a common bird in Japanese cities. Large-billed crows are famous for causing problems in Japan. They raid garbage bags by dismantling them with their beaks. They steal metal coat hangers and insulation to add to their nests. They sometimes nest on power poles where the coat hangers short circuit the wires and cause widespread power failures. So what is this sign about? I can’t read Japanese but maybe you can. Here’s a closeup. If you know what this says, please leave a comment with the answer. I would love to know what the crows are up to! UPDATE: See the Comments below for two translations. I think the sign is saying there is a crow nest nearby and the crows might be aggressive because of it. Thank you for the shout out, Kate. For what it’s worth, I also heard a “Crow Scare” tape being played outside of St. Paul Cathedral (the big one at Forbes and Craig) at around 2 PM yesterday. That area was crow central station last Friday evening so that makes sense. They are building their nests and parent crows are pretty aggressive during that activity. 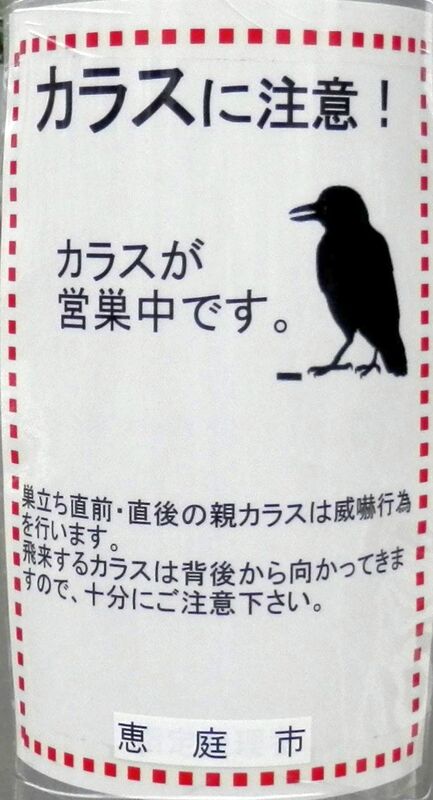 Please be cautious in flying crows that may attack you from your back. That is very funny…I’ve never seen a such notice. I can tell it was on a telephone or electronic pole. My girlfriend’s husband knows Japanese. Here is what he wrote. Parent crows show threatening activities right before and after chicks leave the nest. Wouldn’t it be great if the blue death ray they added to the Cathedral chased the crows away?? Then it would serve a useful purpose. Hah! In all actuality, the light being on might (slightly) benefit the crows. One of the reasons (we think) that gaggles of crows bed down around the Cathedral of Learning is because the streets around it are fairly well lit. A crow’s night vision is about as good as an average human’s and so it follows that the better lit their sleeping area, the better chance of spotting/avoiding any of their night-time predators.